You have TWO WEEKS to play along - Deadline to enter is Friday, January 11 , 2019 at Midnight CST. The winners will be announced on the NND blog the following Monday. 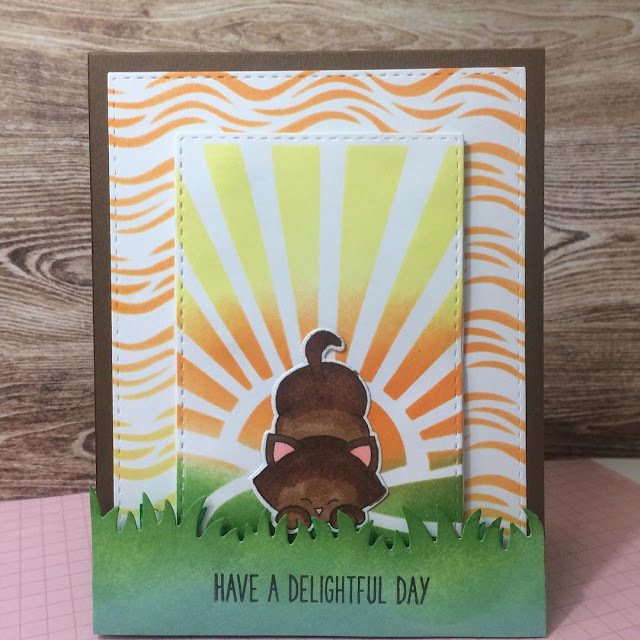 Sue T. created this gorgeous card that will warm up your day! She used the Cup of Cocoa Stamp Set and stamped the cups all over her background, using the colors of the challenge to color them in! What a fun way to create a custom background! Then she cut the scalloped Panel out using the Frames & Flags Die Set. To finish it out she added the sentiment inside an oval from our Ornamental Wishes Stamp Set. So warm and cozy! 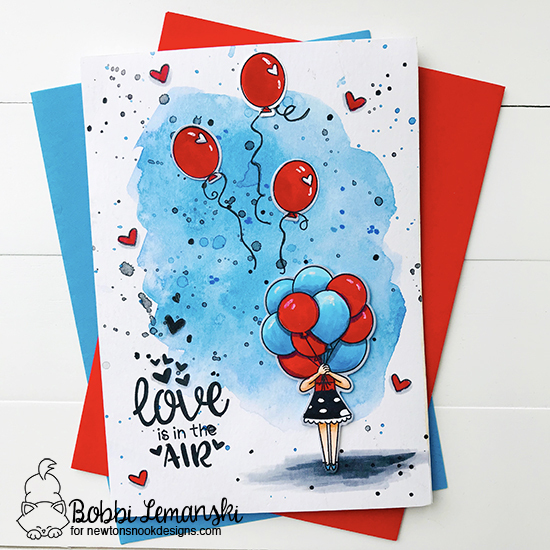 Bobbi Lemanski creates a fabulous water colored background using the black and blue challenge colors. She then adds the main attraction using the Holding Happiness stamp and die set. The fun sentiment that she stamps on her card is from the Uplifting Wishes stamp set. To add even more fun, she adds extra balloons floating away using the Delightful Doxies stamp and die set. Becky Noelle brings us this cozy scene with the snowmen from the Frozen Friends stamp set enjoying a cup of hot cocoa. She creates that fabulous plaid background using the Plaid stencil set. She uses a textured paste to create the white layer. Then finishes the plaid by using red ink. She wraps red and white twine around the bottom before adding dimension tape for a 3D look. Delightful! Debbie Owens creates a water colored background for her New York scene which she die cuts using the Framework die set. 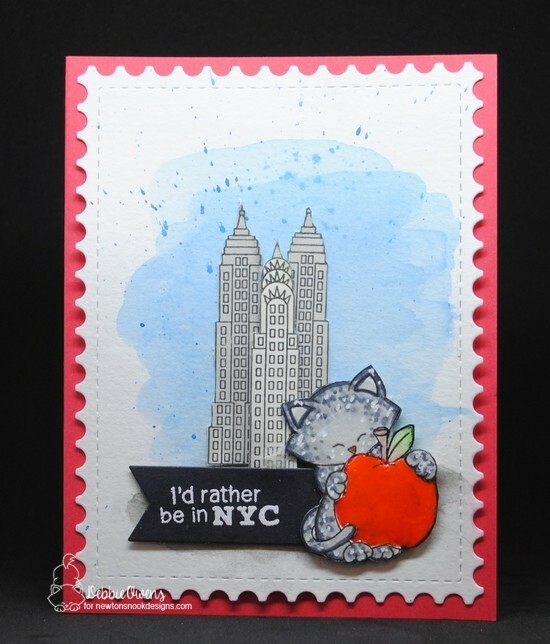 Those tall building and spotted kitty are from the Newton Dreams of New York stamp set as is the sentiment which she embosses in white before die cutting with a banner die from the Frames & Flags die set. She adds Glossy Accents to the apple for a bit of shine. Fun! Diane Morales creates this fabulous circular-shaped card! She uses the Tree Rings stencil to create the subtle ringed background then adds that beautiful cardinal from the Winter Birds stamp and die set. She embosses the sentiment on a sky blue banner. Inky Paws Challenge #87 Winner! 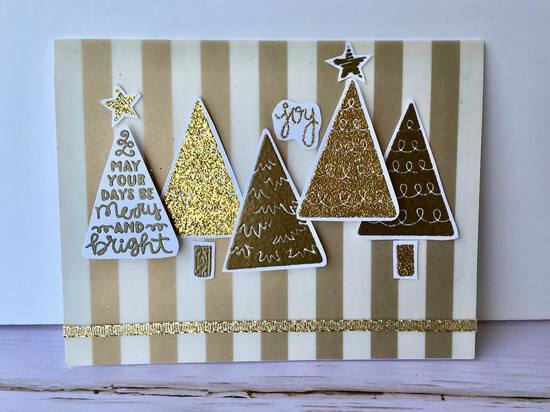 Meghan creates this gold striped card card that features the Festive Forest stamp and die set. She embosses that fun trees in gold and adds the little sentiment. She finishes her card with a gold ribbon near the bottom. Such an elegant and beautiful card! Fikreta creates this festive and fun ornament that spotlights Newton from Newton's Antics stamp set as the main attraction. 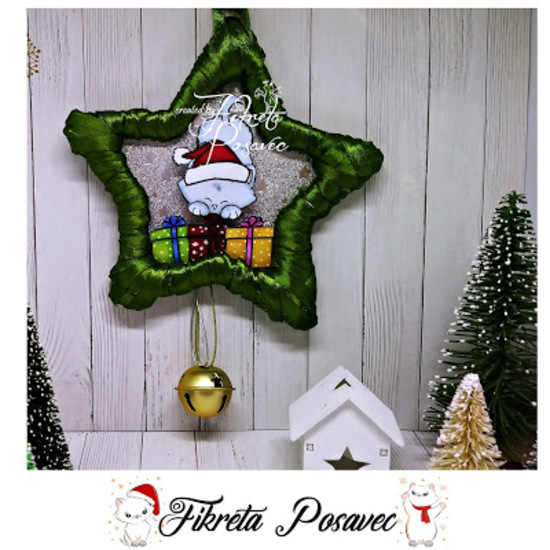 She wraps a gold ribbon around the star shape and adds a silvery middle. She adds some presents, Santa's hat, and a gold bell as finishing touches! Kate's use of gold over the vibrant blue background make this a striking card. She uses the Holiday Foliage stencil with sticky embossing powder and gilding flakes. She then embosses the sentiment from the Reindeer Roll Call stamp set. So pretty! 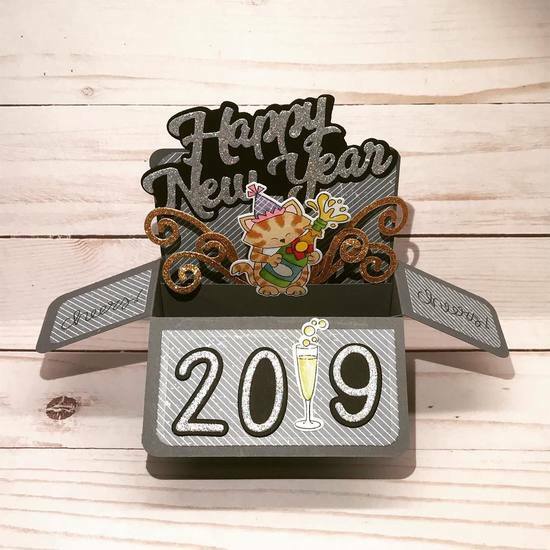 Vicki creates this darling box card to celebrate the upcoming New Year. 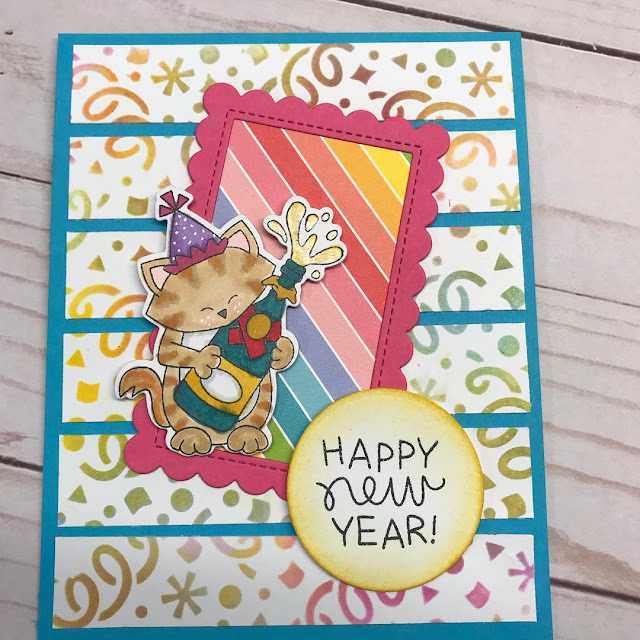 Using elements from the Newton's New Year stamp and die set. Just love how she uses the champagne class as the number 1. What a fabulous design and great use of silver and gold! Meghan's classy card features an elegant collage of whimsical festive trees from the Festive Forest stamp and die set. She adds additional sparkle with the glittery gold stripe and gold and silver sequins! Andrea created this golden delight by using gold foil card stock. For her focal oval, she used distress oxide inks and watered down acrylic paint. 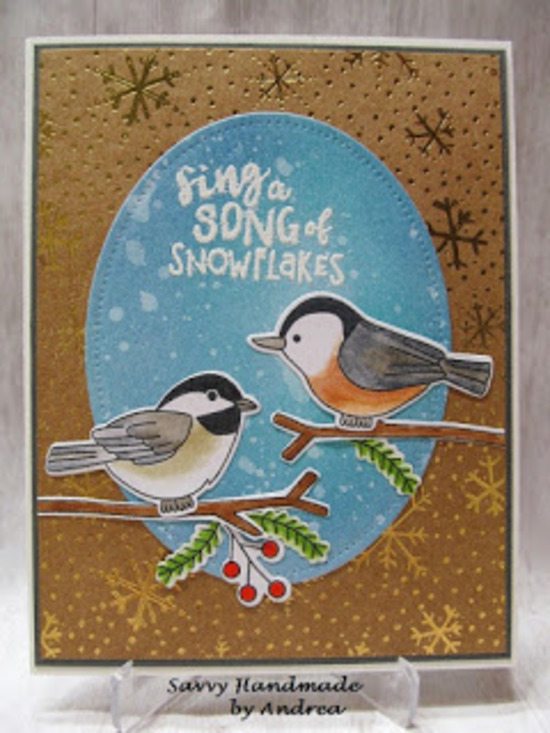 Those darling chickadees are from the Winter Birds stamp and die set. She then embosses that sweet sentiment in white. Fabulous wintery card! 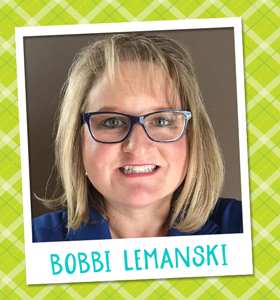 Welcome Bobbi Lemanski to our Inky Paws Challenge Inspiration Team! A NEW member is about to get Inky Paws! First - a quick announcement - There will NOT be a new challenge next week since we are taking a break for one week over the holidays. Hi! I’m Bobbi and I’m super excited to be part of the Challenge Team. My art studio is my happy place. I love color and creativity in all forms – cardmaking, canvas painting, interior design, etc. I live in Wisconsin with my husband, Kevin and our 16-year old twins, Tarek (TJ) and Olivia and our sweet dog, Stelly. I love using bold colors and creating high contrast designs. I get a kick out of finding clever ways to use sets in new ways and/or combos. I like creating and giving a 5” X 7” card. It has more of a presence and it gives me more room to design. You can find me on Instagram as @soulshinejoy and Facebook as SoulShineJoy. My blog, Soul Shine Joy includes many more cards featuring the fabulous Newton’s Nook Designs products. We are also happy to announce that these fantastic designers will be continuing on the team! We know you've been enjoying their work so far and we can't wait to see what they create next! They will be sharing their lovely creations with you each Monday for Inky Paws Challenge Start and Reminder posts! We can't wait to see what they create in the new year! Hi, my name is Debbie, aka Indy. I live in Washington with my hubby and two fur babies--Catapult and Velcro. I have several passions in life--cats, card making, clay ornaments, coffee, chocolate, and camping! I began card making back in 2010 and reached out to the Internet for inspiration and ideas! In 2013, I discovered Newton's Nook Designs and completely fell in love with Newton and his gang of whimsical friends, so I am thrilled to be part of the Inky Paws Challenge team! 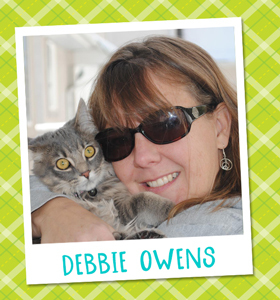 I live in West Columbia, Texas with my Husband and the tribe of three cats. 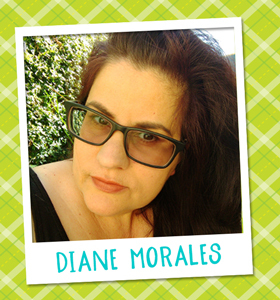 Like most, I started in scrapbooking and moved into full time cardmaking about 2 years ago. I love cardmaking! I enjoy hand painting on my cards and usually created shaped cards or tags. 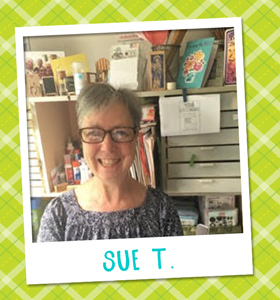 Hi, I am Sue T. - yes that is what everyone calls me. I have been stamping since 1996. It truly became an obsession when a stamp store opened 5 minutes from my house. I love making cards. There isn’t a holiday that I don’t send them out. I have dabbled in just about every style over the years, but have found my niche with CAS cards. I have worked in several stamp stores, had my own business teaching paper crafts and designed for challenge sites and stamp companies. I love to share my knowledge and creativity. In the real world, I am a FT endoscopy nurse and very close to completing my Master’s in nursing education. I have a wonderful husband who is my best cheerleader and critic. My muse in my studio is my sweet kitty, Pinkie. I love whimsical stamps, especially those cute little critter stamps. 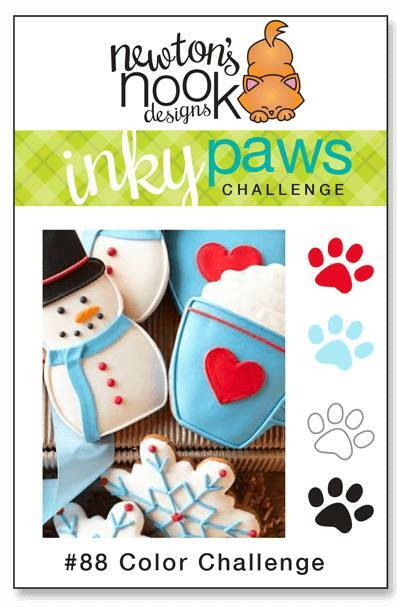 That’s why I am so excited to be part of the Inky Paws challenge for Newton’s Nook!! Hi! I'm Becky and I'm super excited to be here! I'm a stay-at-home mom to two little princesses and wife to a big kid. We live in Virginia and I sneak away upstairs to my studio during naptime, whenever the girls are watching a movie, and as soon as they go to bed. I'm a cardmaker, Project Lifer, and general practitioner of crafty pursuits. I can't seem to stop fussy cutting all of the things and I love to color. I'm a lover of Star Wars, Marvel, Disney, the Wizarding World, kindness, and sarcasm. 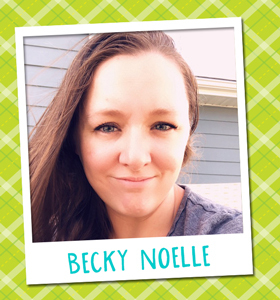 You can find me at my blog beckynoelle.com or over on instagram as beckynoelle I can't wait to start sharing my projects with you! Hope you are excited to see what everyone creates! We definitely are excited for a new crafty year in 2019! Debbie Owens gives us this sweet, whimsical card featuring a ballerina mouse from The Nutcracker Squeak stamp set. For her background she uses a golden vellum and adds an embossed white layer which she cuts using the Frames and Flags die set. She adds the sentiment on the banner and layers. She adds a ribbon and holly boughs using the Pines & Holly stamp set. She finishes with a gold glitter sticker and sequins. Diane Morales created this silvery background using the Starfield Stencil. She then adds her snowy horizon using Land Borders Die and adds silvery trees which she die cut using the Forest Scene Builder Die. Her final touch is the little lamb from the Fleece Navidad Stamp Set. Her pop of red is the perfect contrast! Absolutely delightful! 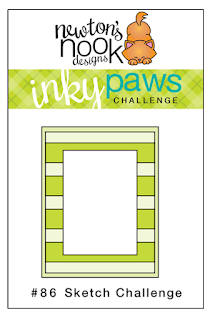 We are sadden to say this will be Emily's last Inky Paws Challenge card. We've loved having Emily on our design team with her amazing creativity. Best wishes as you in your future endeavors! For her final card, Emily Lauritzen creates this festive and bubbly background using the Bubbly stencil and foil! Wow! She wonderfully colors Newton from Newton Celebrates stamp set as he celebrates in style. All these elements are placed atop her silvery background die cut using the Frames and Flags die set. 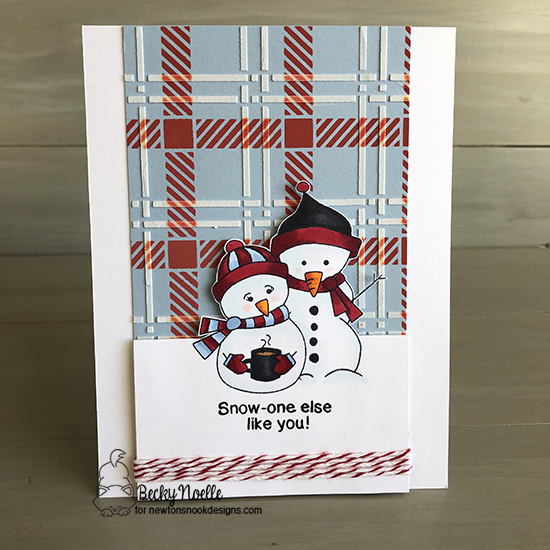 Sue T.'s winter wonderland card is spectacular! 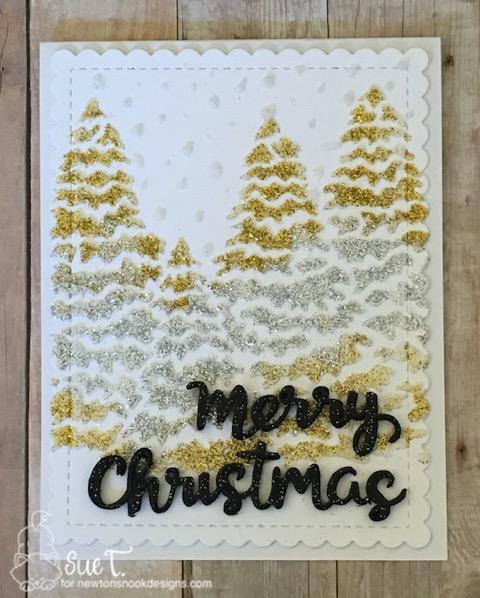 She used the Petite Snow stencil to create the snowy sky and adds golden trees using the Festive Forest stamp set. Using the Framework die set, she cuts the background and adheres to a black card base. 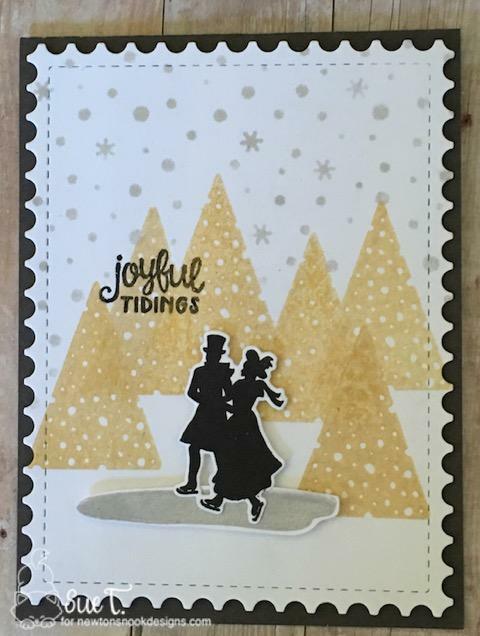 Using the Winter Memories stamp and die sets, she adds the focal point of her card--this lovely couple ice skating. She finally adds the black sentiment to finish her beautiful card! Becky Noelle creates personalized holiday cards by including her family picture! She stamps and colors the flowers on the corners on kraft paper using the Poinsettia Blooms stamp set and fussy cuts the inside edges. She adds her sentiment on a tag from the Tags Times Two die set and attaches with a bit of twine! I hope these projects have inspired you to play along! Remember, you have until this Friday, December 21, 2018 to enter. There's a prize involved too, so don't delay - view all the entries and see more inspiration on our Inky Paws Challenge here! You have TWO WEEKS to play along - Deadline to enter is Friday, December 21 , 2018 at Midnight CST. The winners will be announced on the NND blog the following Monday. 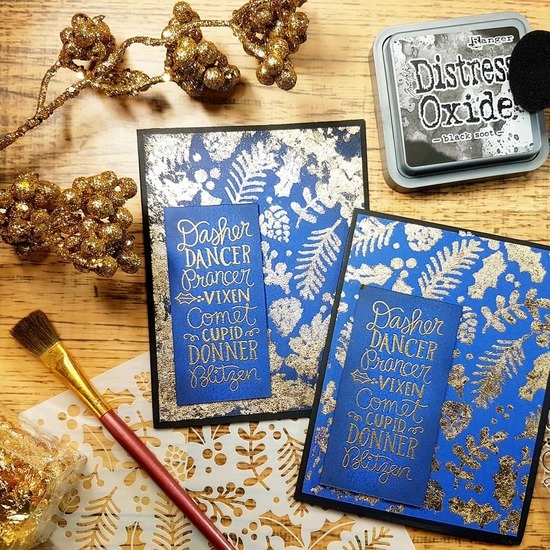 Debbie Owens creates this golden card by die cutting the background with it's gold foiled design using the Frames & Flags die set. She then adds a wide red ribbon to create a central stripe. She layers elements from the Pines & Holly die set using foiled card stock. For her focal point, she stamps and embosses the sentiment using Ornamental Wishes stamp set and frames it using the Ornamental Shaker die set. Red sequins finish this golden delight! Diane Morales uses Kraft card stock as her base with looks fabulously with the silver and gold elements. She uses the Frames & Flags die set to cut her center background. Then shes uses a trio of trees from the Festive Forest stamp set and embosses in silver and gold. Wonderfully done! Emily Lauritzen chooses soft blues to complement the silver in her card. She uses the Plaid stencil set with silver and blue inks to create a pretty design and then rotates it to overlay the white base. She uses the Frames & Flags die set to give it the scalloped edges. She softly colors the flowers from the Poinsettia Blooms and adds it to her base. She pulls words from one of the sentiments from Sentiments of the Season stamp set. So soft and elegant! Sue T. brings on the glitter with this gorgeous card. She uses the Petite Snow stencil to create a snowy sky. Then she uses the Evergreens stencil and silver and gold texture paste for those shimmery trees. 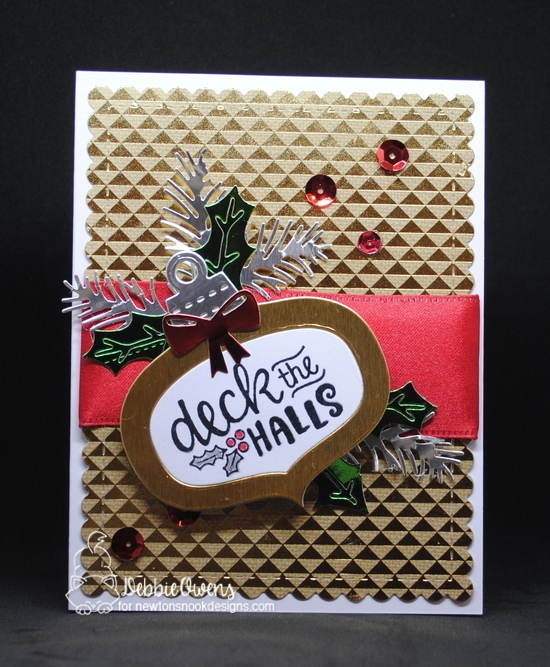 For the Merry Christmas sentiment, Sue uses a die from the Holiday Greetings die set with a glittery black paper! A spectacular card! Becky Noelle wows with this gorgeous card. Her amazing background uses the Plaid stencil set with some Distress Oxide inks, transfer gel, and foil. 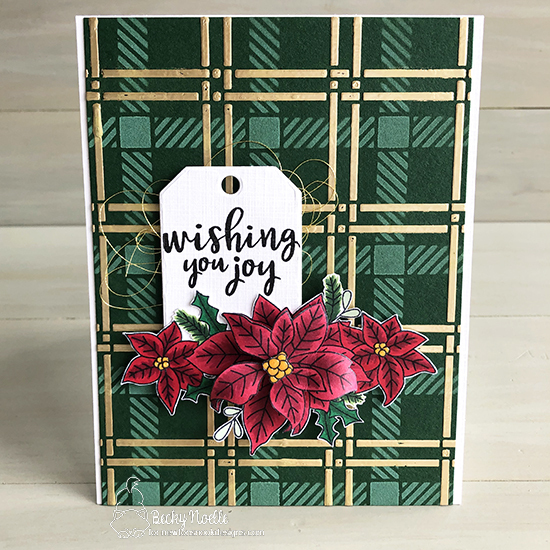 She adds her wonderfully colored flowers from the Poinsettia Blooms stamp set and places her sentiment on a little tag from the Tag Times Two die set. She adds some golden thread behind her tag for an added touch of elegance. Again, striking! the Newton's Nook Designs blog! This Biweekly Challenge was a Sketch Challenge. 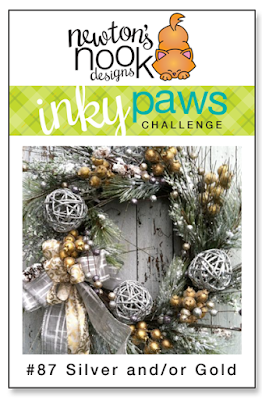 Inky Paws Challenge #86 Winner! 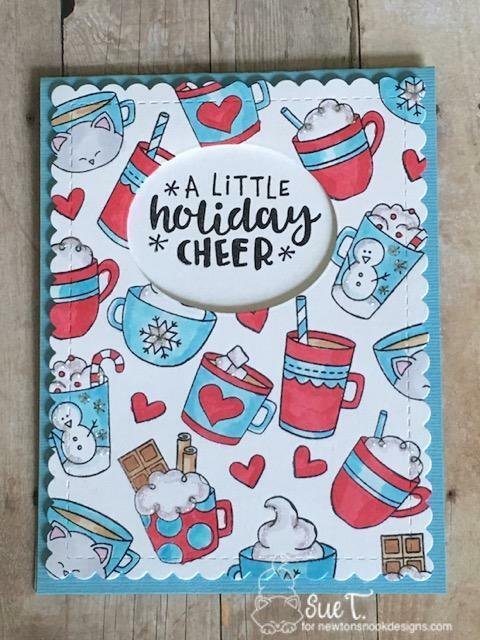 Meghan designs this bright, cheerful card by selecting this festive pattern paper that has stripes of holiday delights. 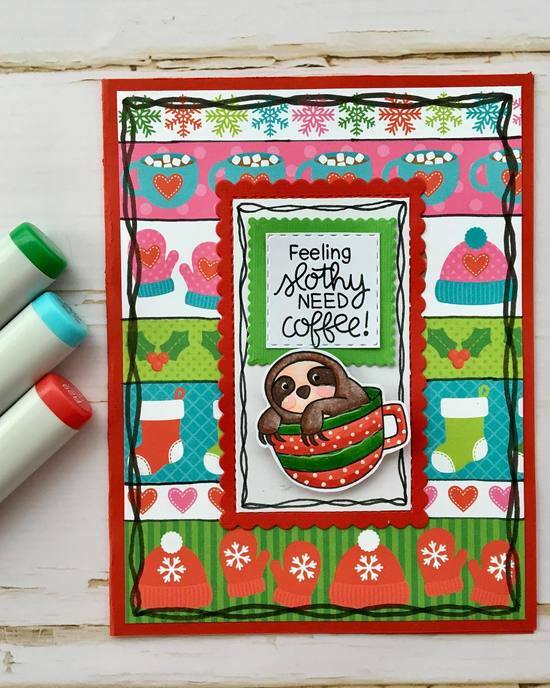 The star of her card is that darling sloth peeking over the coffee cup rim! He is from the Slothy Coffee stamp set. Oh how fun! Irene's fabulous card would win any coffee-lover's heart! 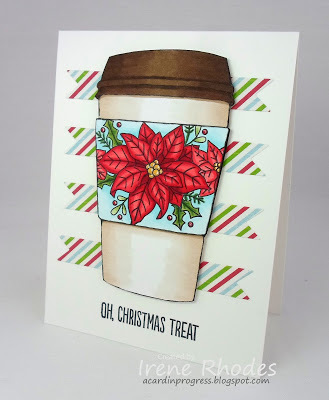 She creates that gorgeous cup cozy using the Poinsettia Blooms stamp set. She beautifully colored flowers look striking against the light blue background. She then adds striped banners using pattern paper to complete her card. Melanie uses the sketch to create a pretty in pink card! She uses pale pink lace to create her stripes which she places atop a frilly die cut background. Then she adds a scalloped circle and places her feline from the Newton Loves Cake stamp set. So sweet! Vicki uses the Confetti stencil to create this bright, festive background that she breaks up to create the background. She then adds a red frame using the Framework die on top of the brightly striped paper. Then she adds a celebratory Newton from the Newton's New Year stamp set. Katrina creates this fabulous sunset using the SuncScape stencil. To create the stripes of the sketch, she uses the Waves stencil using the colors as her sunset. Using the Land Borders die, she creates grass on which Newton from the Newton's Antic stamp set can romp and play! Bobbi creates this striking and dramatic background on which those darling moose from the Moose Mountain stamp and dies can snowboard down the mountain! The snowflakes throughout make for a fun winter scene and the speech bubble is a fabulous way to add the sentiment. Bravo!